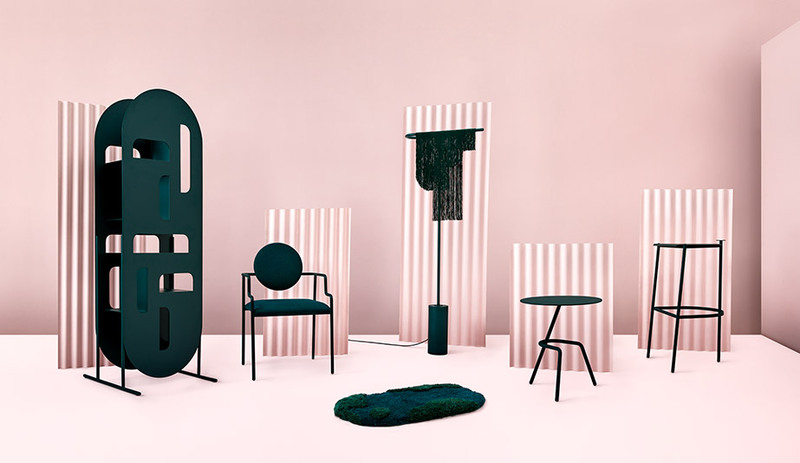 In 2018, Toronto’s Hi Thanks Bye announced itself as one of Canada’s hottest emerging studios with the launch of its inaugural furniture line. 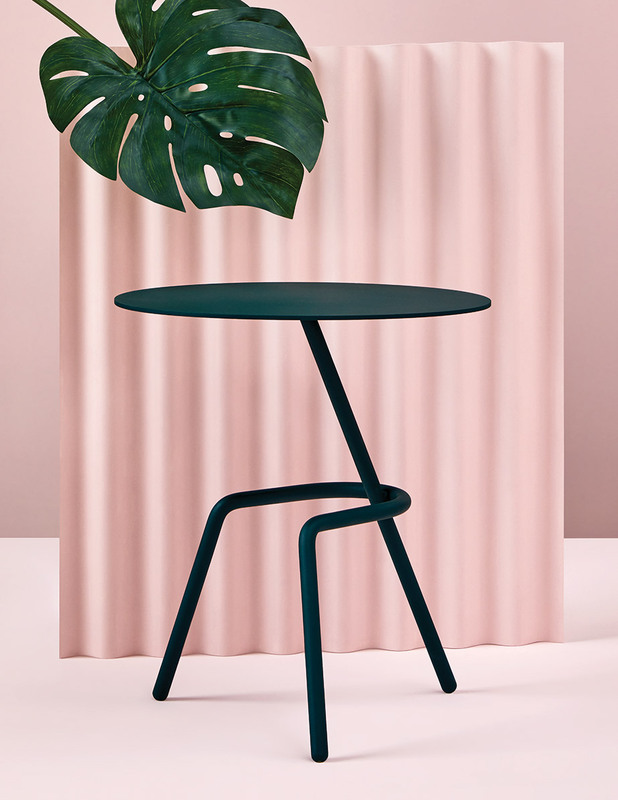 Collection O, revealed at the Stockholm Furniture Fair, comprises five sculptural steel pieces: a laser-cut shelf, a geometric chair, a fringed floor lamp, an angular side table and a sleek bar stool. Completing the series, a shaggy wool rug, which also makes a unique wall hanging, was introduced in a matte forest green so deep that it appears black at first glance. Stein Wang and Topher Kong, the studio’s founders, have been refining these pieces over the past few years. The minimal geometry of the RO chair, for instance, will feel familiar to anyone who has seen Kong’s Toronto Design Week contributions over the past two years. The duo says that their Chinese-Canadian backgrounds inspired them to combine the aesthetic appeal of a traditional Chinese garden with the natural beauty of Canada’s islands. 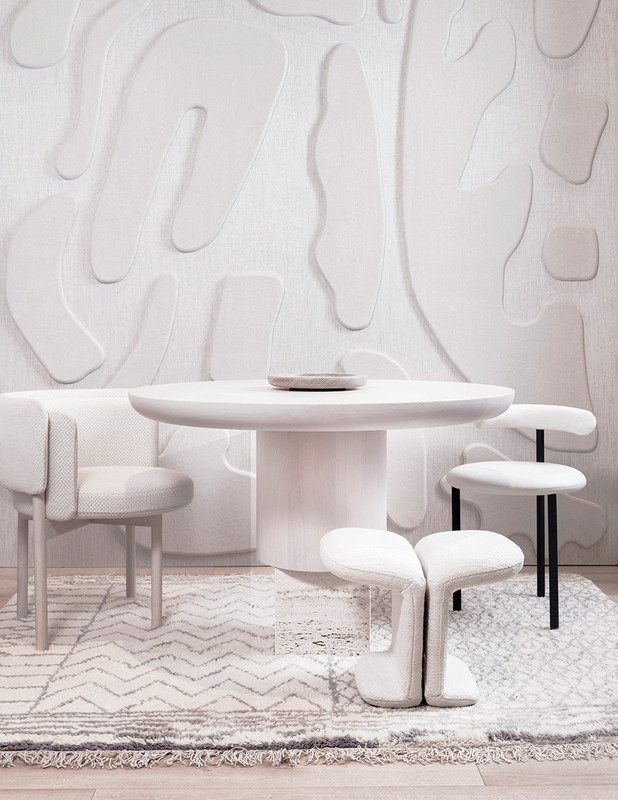 Hence the VO table (resembling a lily pad) and the OO rug (a collaboration with Toronto textile designer Avis Ho evoking the “plush feeling of stepping on moss”). Why we like it: There is a lot of talk about Canada lacking its own design identity, but we think that this finely balanced cross-cultural inspiration is uniquely Canuck. 2018 was a big year for reissues. 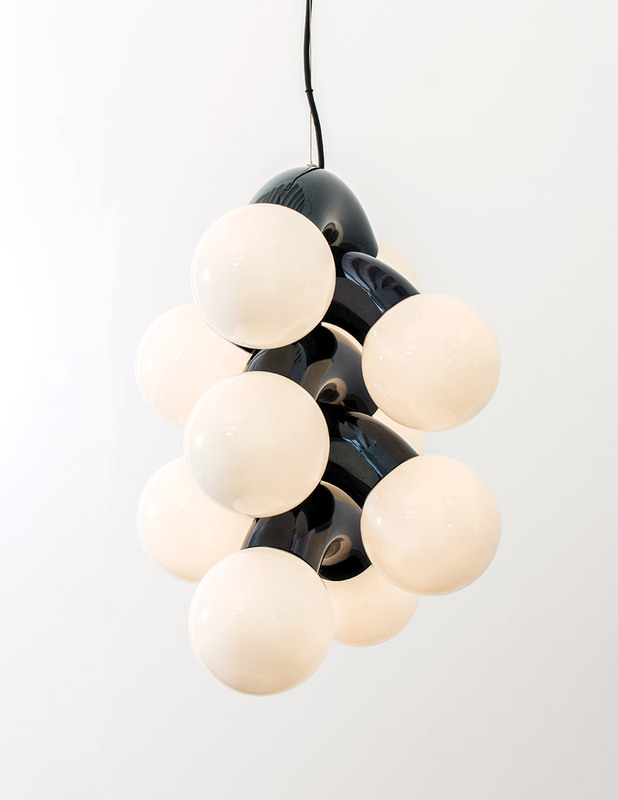 One of the most interesting was the reintroduction of Paul McCobb, a mid-century modernist whose work – unlike that of his contemporaries Verner Panton and the Eameses – fell out of production after he died in 1969. McCobb was a designer’s designer, a minimalist who referenced Shaker-Scandinavian-International Style austerity but was quintessentially American. His claim to fame, after all, was that he designed the 1952 set for the original Today show. 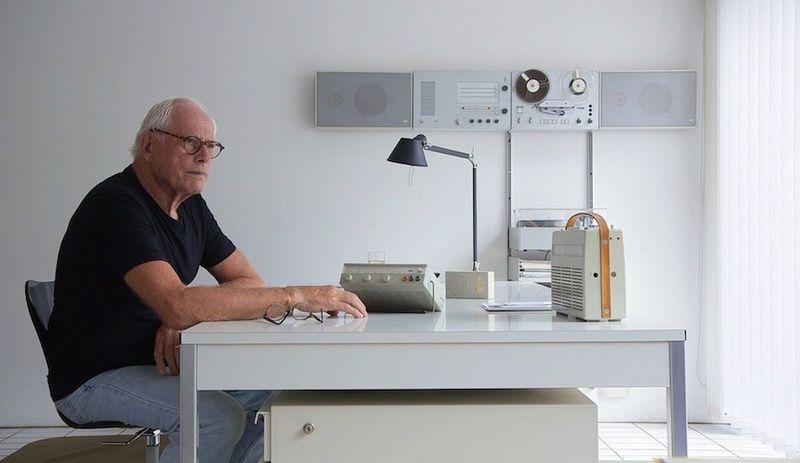 The Danes still feel an affinity for him, and thus it was that Fritz Hansen released the Planner tables (designed in 1953 and so named because the ever-practical McCobb wanted to create a piece around which an entire room could be planned). 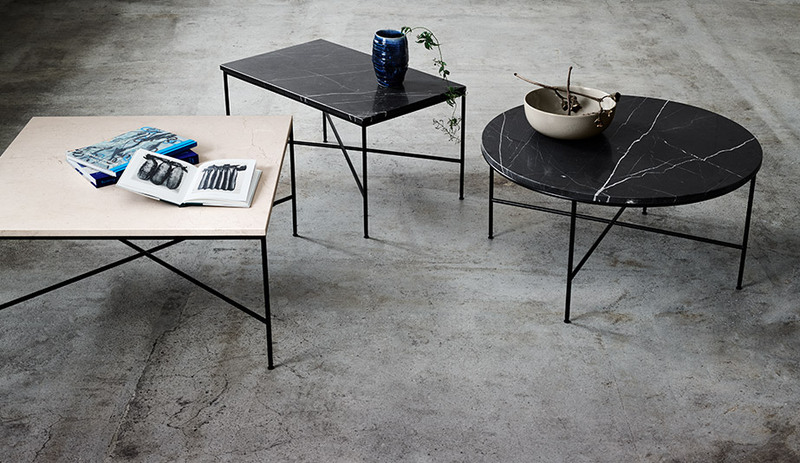 Celebrating clean lines in place of ornament, the coffee tables come with square, circle and rectangular tops made of 20-millimetre-thick stone resting on elegant steel frames. Why we like it: With its attention to detail and emphasis on classic materials, the collection feels as contemporary today as it did in 1953, proving that modernism itself is timeless. From the moment we spotted Vine in Milan, it was love at first sight. Can you blame us? Vancouver’s Caine Heintzman, co-founder of ANDlight, took a fearless approach, pumping up scale and exaggerating proportions to dramatic effect. Simultaneously rugged and refined, Vine is, at its heart, rather simple, pairing only two components: curved steel tubes and opal glass spheres. But Heintzman’s execution turns simple into spectacular. Playing with the strength of repetition and vertical scaling, the tubes are stacked one on top of the other, turning 90 degrees as they climb, giving the fixture organic movement. 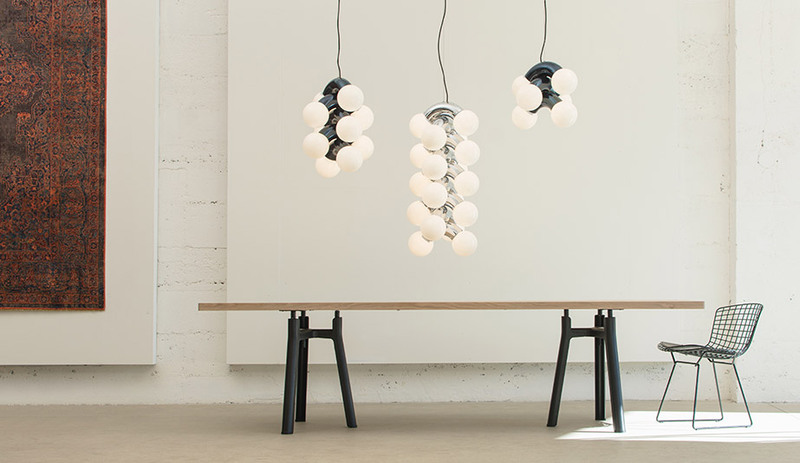 Rendered in steel with a powder-coated-chrome or midnight-blue finish, the Vine series offers wall- and ceiling-mount fixtures and pendants with up to nine branches. Why we like it: Along with its undeniable good looks and the fact that it’s the brainchild of a homegrown talent, Vine also uses low-wattage LEDs, proof positive that large-scale lighting can be low-energy. Responding to the continuing and complex need for workspaces to be all things to all people – collaborative but with spaces for privacy, informal but functional, conducive to both creativity and employee well-being – Allsteel joined forces with Copenhagen’s Norm Architects and delivered one of the most visually pleasing and diverse furniture collections we’ve seen yet. 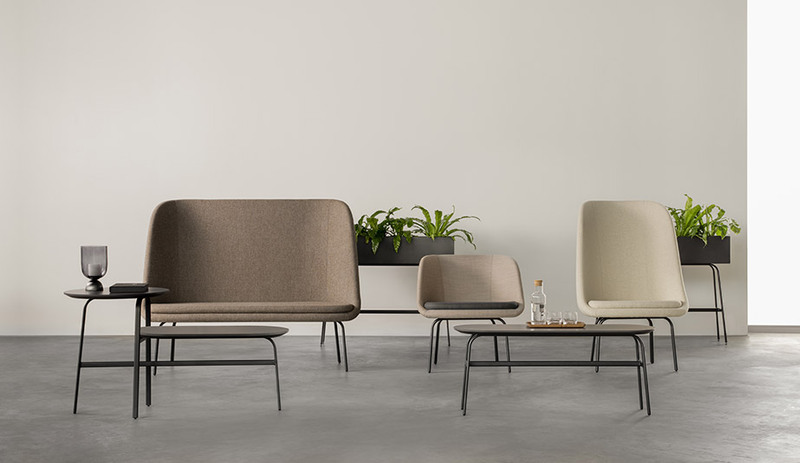 Titled Park, the series is defined by gentle and graceful lines, tactile upholstery and a warm tone-on-tone palette, with the individual pieces – lounge chairs and settees, a mobile monitor holder inspired by an artist’s easel, even trough-like planters/storage units – formidable enough to stand on their own but which really sing when grouped together. 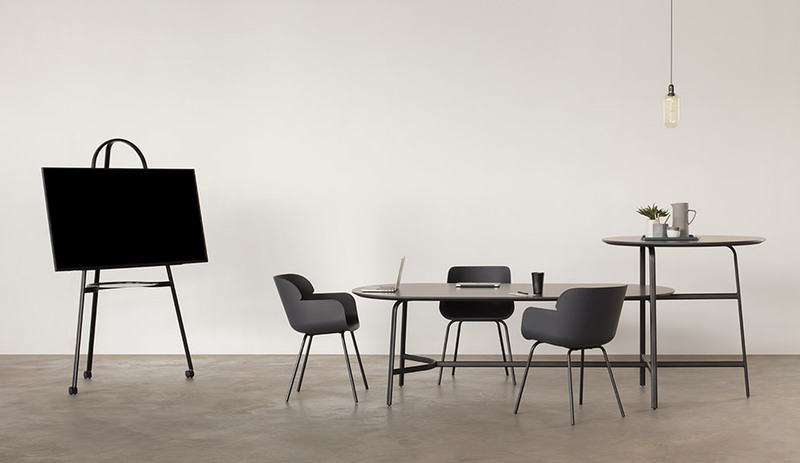 A masterful representation of the refined and elegant aesthetic that Norm Architects is known for, Park is also extremely flexible, able to be easily reconfigured to meet changing needs, each time creating a welcoming scenario. Why we love it: The carefully considered family successfully treads the line between office and residential design, bringing stay-a-while comfort to the workspace landscape. When ceramic waste is recycled, porcelain aggregate is typically gathered, crushed and remoulded into an unrecognizable product. 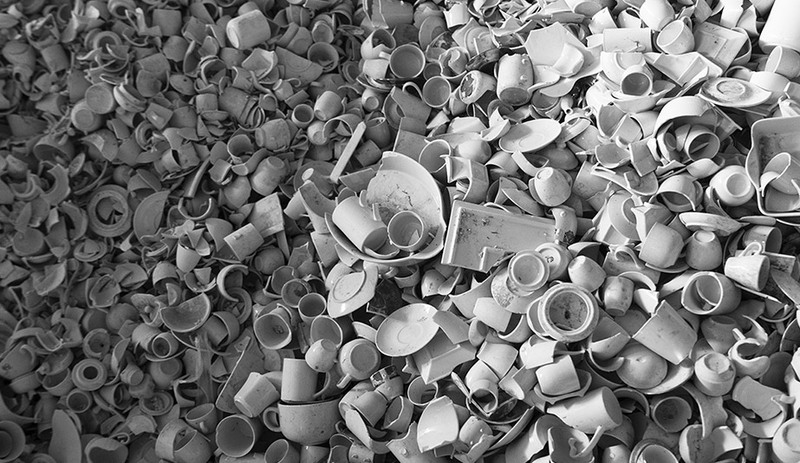 But Guangzhou-based Bentu Design, a studio best known for its brutalist-inspired concrete furniture, has found another use for discards in its Wreck Collection, which celebrates the beauty – and the previous life – of broken ceramics (sourced in this case from high-volume ceramics factories in Chaozhou). Instead of turning porcelain waste into powder, the firm incorporates entire pieces of cups, bowls, Starbucks mugs and even Buddha statues into a line of moulded concrete tables and benches. 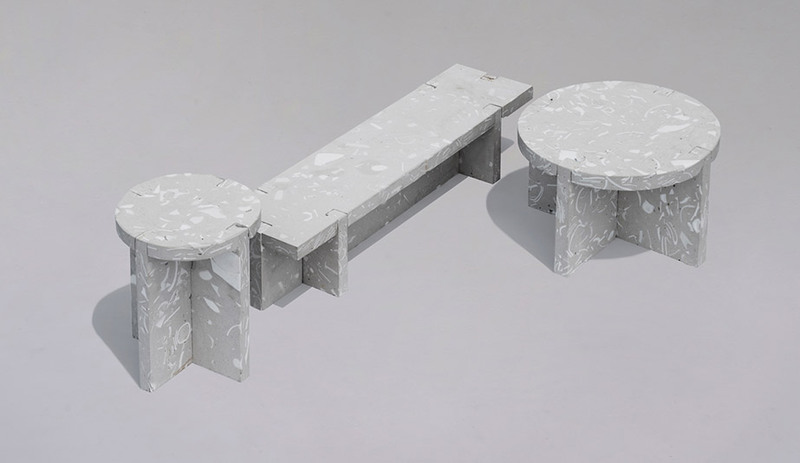 The result is almost terrazzo-like: Squiggles, circles and geometric shapes are visible on the surface of each item in Wreck, which was first unveiled during Shenzhen Design Week. It’s proof that the circular economy can indeed be beautiful. Why we like it: By plainly reincarnating discarded ceramics, Bentu Studio has created a more sustainable product that also quietly asks us to examine our consumerist habits. Patricia Urquiola is the reigning queen of trend-setting design. Her continuing collaborations with Moroso, Gan, Foscarini and others only get more interesting with time. 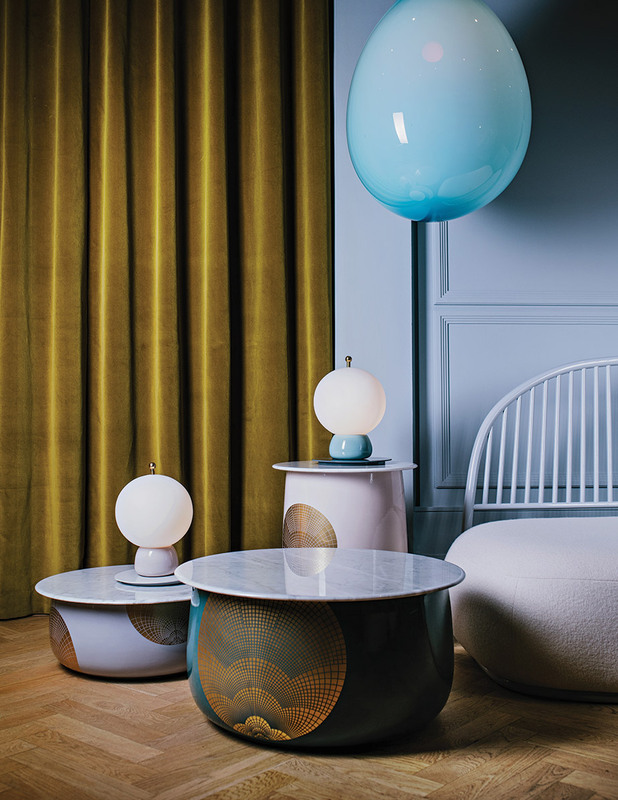 A longtime champion of pattern, texture and dimensionality in furniture, she has lately been a strong proponent of prismatic colour – one of our favourite themes of 2018 – in everything from her Slinkie rugs for CC-Tapis and cabinet for Editions Milano to her Shimmer collection of tables, lights and consoles for Glas Italia. L.A. Sunset is the newest creation for the latter manufacturer – and it’s pure delight. The low round tables comprise a metal tub structure and a laminated glass top treated with a colour-shifting opaline finish. Why we like it: It’s simply beautiful. 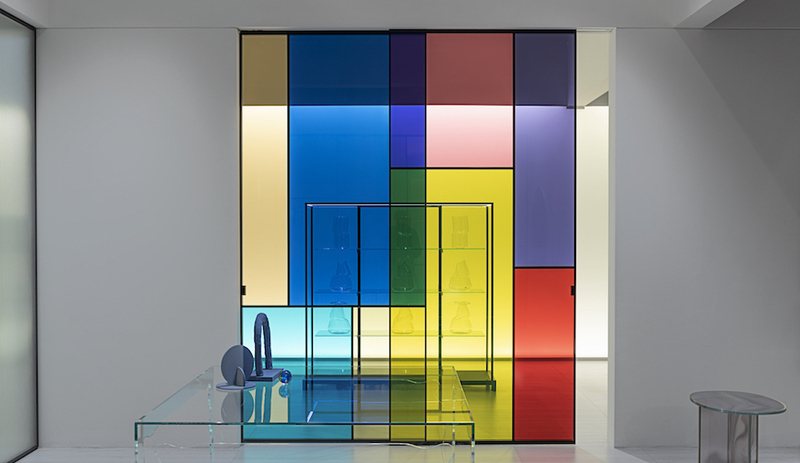 Kartell is synonymous with shiny, curvaceous plastic. And for good reason: The ductile material can be shaped into inventive forms, allowing industrial designers to dream big. But during Milan Design Week, the manufacturer applied the elasticity of plastic to natural materials, turning to longtime collaborator Philippe Starck – the designer behind Kartell‘s iconic Ghost Chair – to develop the Woody collection. 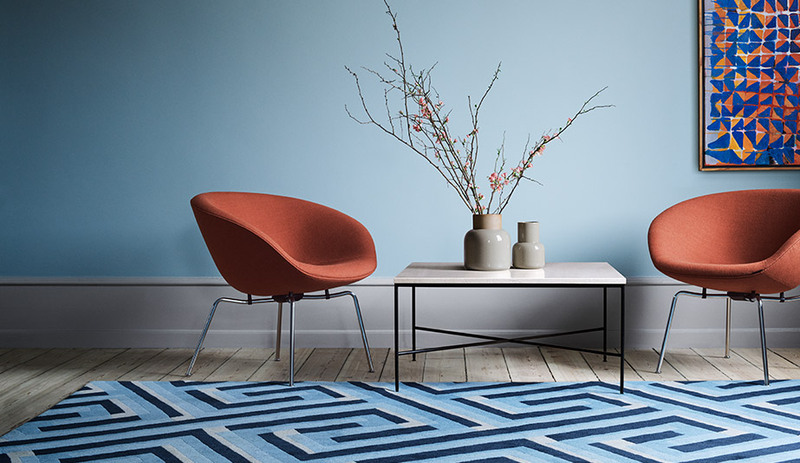 Consisting of the Queenwood and Kingwood armchairs, the Princesswood chair and an ottoman, the family boasts sinuous curves that recall the brand’s injection-moulded offerings. To achieve rounded backrests, Kartell patented a method of machining, bending and moulding wood in ways that seemingly defies material boundaries, resulting in furniture that’s both effortlessly natural and strikingly futuristic. The collection is available in ash and striped rosewood with plastic or leather upholstery. 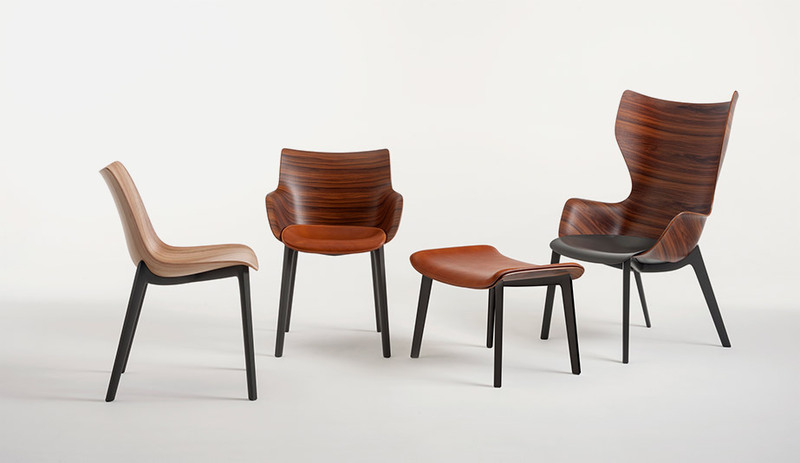 “After more than 30 years of research,” Starck said, “we have finally created wooden seats that really express, thanks to the alliance with plastic, the true essence of wood.” We agree. Why we like it: As we identified in our Trends Issue (October 2018), it’s a perfect example of how designers are twisting, bending and curving wood in contemporary ways. If this keeps up, wood could very well replace plastic. 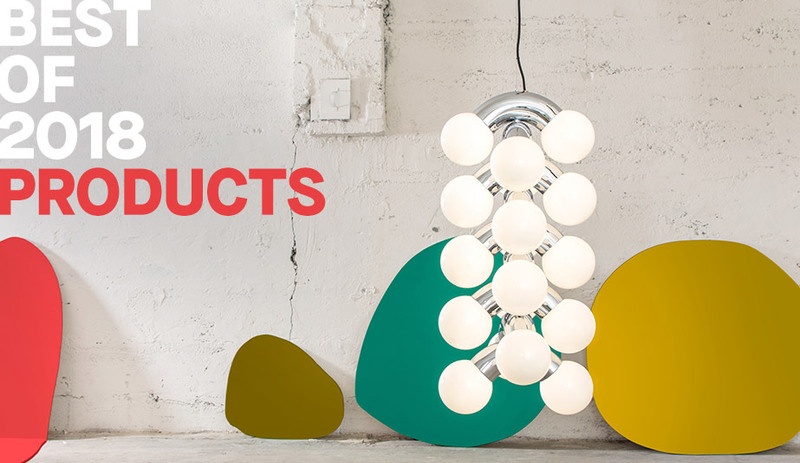 After the tremendous success of their 2016 collaboration Alphabet, it was no surprise that Artemide and BIG teamed up again in 2018. Launched at Frankfurt’s biennial lighting expo Light + Building, Gople is a series of large-scale pendants that meld new and old technology. 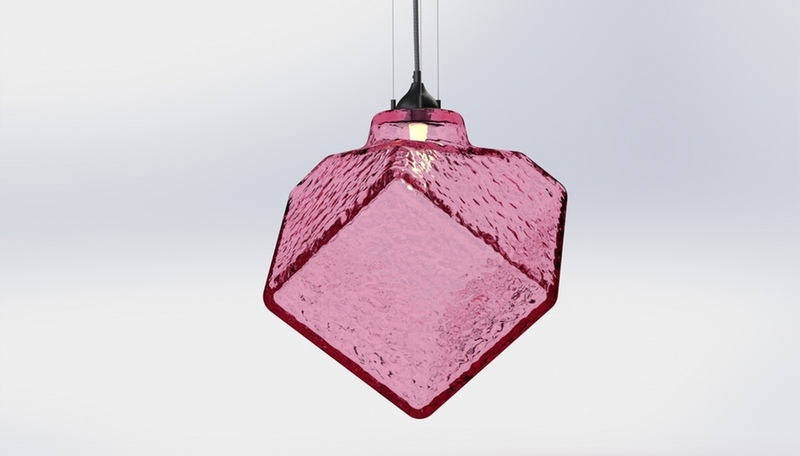 Each glass shade is mouth-blown using traditional Venetian techniques and then combined with patented RWB LED sources that not only enhance well-being for the human occupants of a space but also boost the growth of plant life. 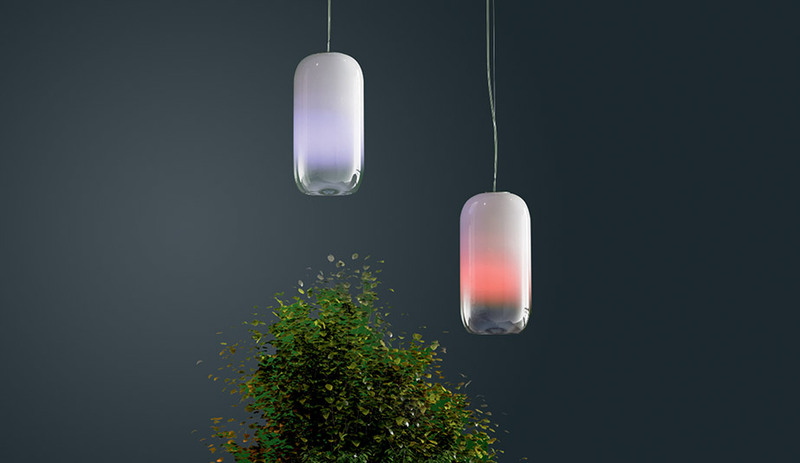 The lamps, which are available with silver, copper and white tinted glass, support different phases of the plants’ life cycle with red and blue radiations at varying wavelengths: Red radiations between 575 and 625 nm, for instance, are ideal for blooming phases. The same LEDS can be used to create ambient effects and also are perfectly functional as everyday lighting. Why we like it: Like so many Artemide products, it packs amazing technological innovation into a lamp that is so beautiful you’d want to buy it anyway. Balance. Support. Blessed simplicity. Who wouldn’t respond to such qualities in today’s chaotic world? The fact that they’re expressed so warmly and sensuously in Studio Paolo Ferrari’s 11-piece Edition Three collection – a follow-up, appropriately enough, to the Toronto-based designer’s Edition Two, released in 2017 – makes each item in the latest line all the more alluring. Handcrafted in Canada, the seating, tables and shelving that make up Edition Three straddle the line between furniture and sculpture, utilitarianism and artistry. 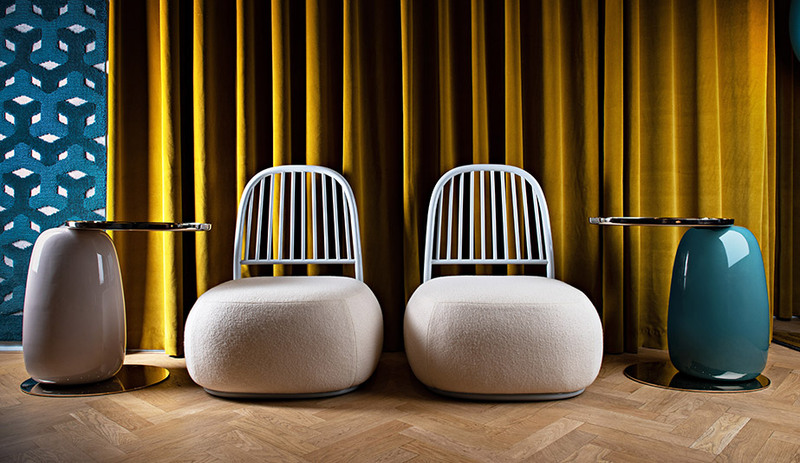 The chunky, barrel-sided Extra Low Rolled Back Lounge (pictured at top) is as glamorous as it is grounded, while the wing-like seat of the T Stool (seen in the foreground above) is both practical and poetic, suggesting a bird in flight. In several instances, Ferrari has expanded on and refined already exquisite pieces from earlier collections, proving that lightning can strike an evolving series a third time. 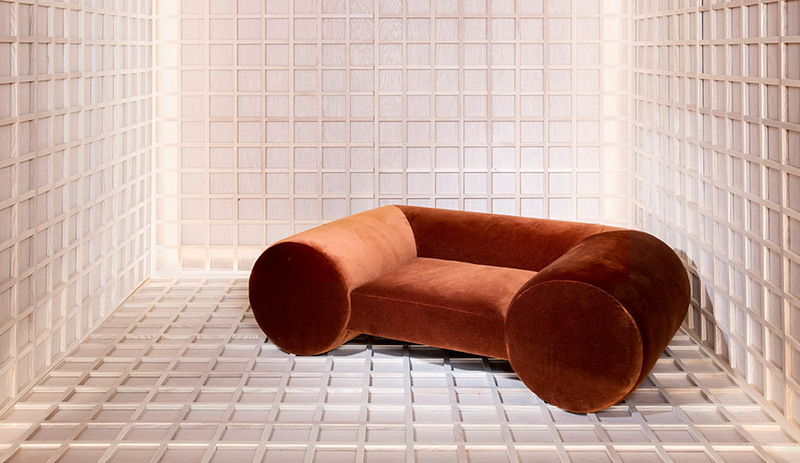 Why we like it: A disco-worthy lounger that you can curl up in? Count us in. “I always start a project by going through my records and pulling out stuff that encompass the feelings I’m trying to express; it’s like having an auditory mood board,” the American-born designer Ini Archibong, now based in Switzerland, told Azure recently. 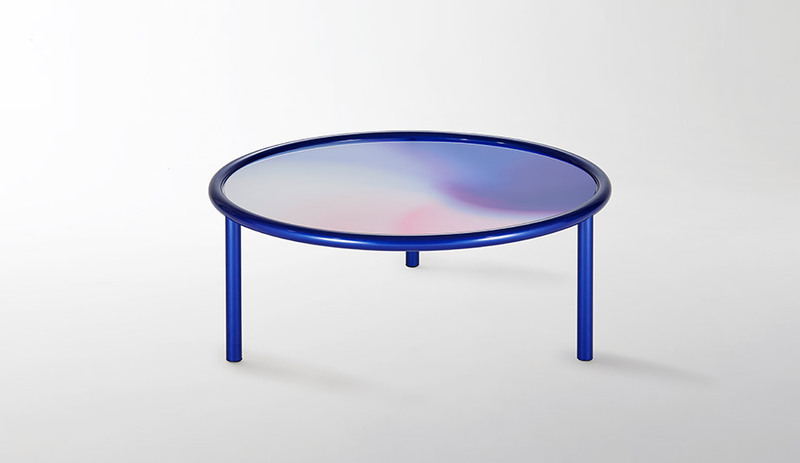 For his 2018 collaboration with the London furniture brand Sé, called Collection IV: Below the Heavens, he was clearly in a happy, exuberant mood: The seating, tables and lighting in the collection are glossy, plush and bright, projecting a clear sense of optimism through a rich and sophisticated lens. According to Archibong, Collection IV was inspired by the shiny low-rider cars he grew up around in California, with their “colourful paint jobs, plush, velvety interiors and lots of chrome.” As expressed through his furniture, this nostalgic vision translates into high-shine tables and lighting fixtures with hints of industrial style and invitingly wide, lushly upholstered lounge chairs as low to the ground as those vintage autos. Although the collection is subtitled Below the Heavens, there is an ethereal – dare we say heavenly – air about it. Why we like it: European refinement meets American exuberance in one of the most original, sophisticated furnishings collections of the year.